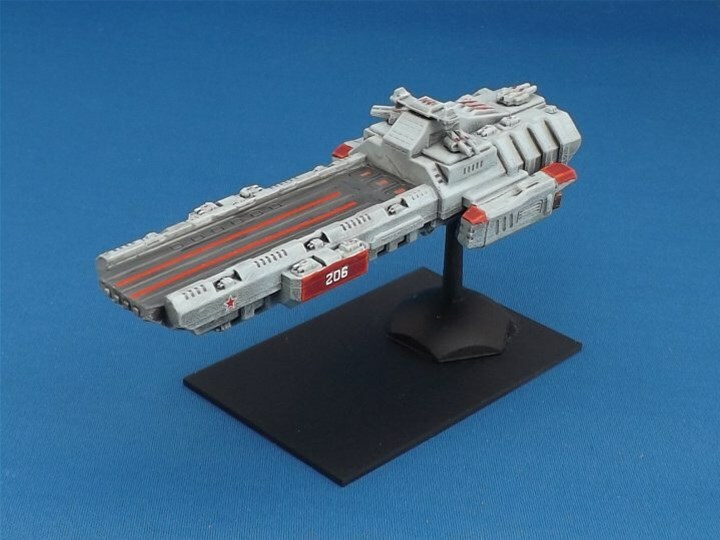 The 6mm sci-fi Neo-Soviet Ulyanovsk supercarrier SFS-1211 made its debut at Brigade Models. At 115mm long, this is a huge model, the largest spaceship we’ve produced so far. The hull is resin, with four metal engines, three heavy gun turrets and a metal bridge to top it all off. It carries as many as fourteen fighter groups, along with the three battleship-class mass accelerator turrets and a myriad of secondary weapons. It has hefty shielding along with armour plating, so is a very tough nut to crack – you can find the Starmada-X playsheet here. 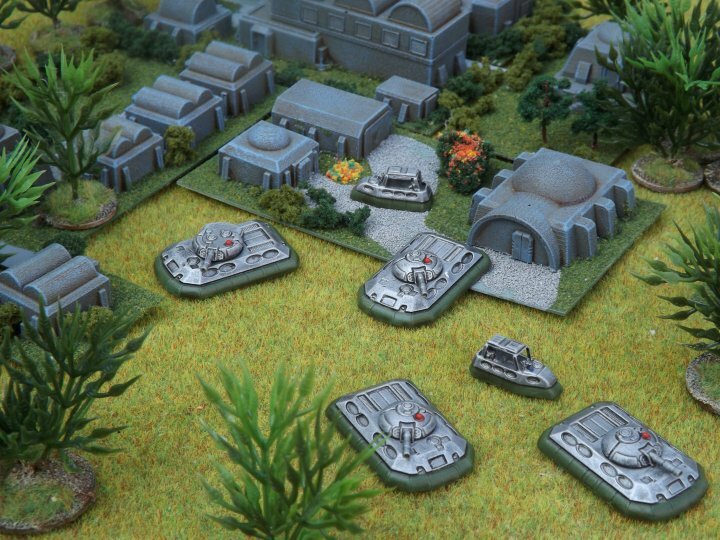 Brigade Models give us that sinking feeling with the release of some stellar sci-fi sunken/underground terrain models in 6mm! The desert is a harsh environment, with the combination of sun, sand and wind making life difficult for anyone trying to eke out an existence among the dunes. Some colonists have tried to protect themselves from the climate by digging themselves into the terrain and building their houses, workshops underground. In some cases they’ve built above ground and then buried the structures under a layer of plascrete and sand, leaving just the doors and windows exposed, with a few vents and exhausts. For want of a better name, we’ve called these ones Sunken Structures. They’re based around a courtyard sunk into the ground around 25 feet or so, with doors and tunnels leading off from the open central area. Windows and vents pierce the side walls and exhaust towers protrude above the surface. Access from ground level can be by simple stairs cut into the rock or elevators running up the side of the pits. Some are accessed through small entrance buildings on the surface above. One of the structures is an octagonal pit with a large workshop door off to one side, intended as a below-ground landing bay. The models are one-piece resin castings. 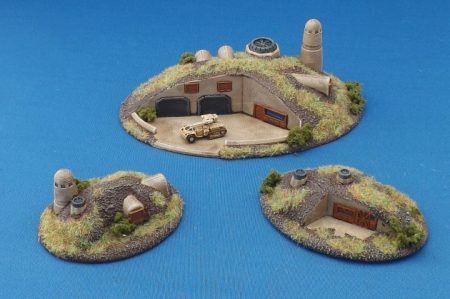 They’re all cast as simple square or rectangular pieces, and all are 25mm deep – the idea is for them to be modeled into a terrain baseboard or hill/mesa using 25mm thick insulation foam. 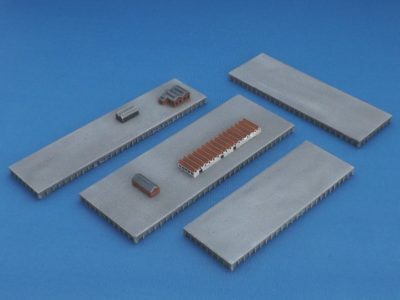 Two new Small Scale Scenery items have arrived on the Brigade Models website allowing you to make a more extensive harbour layout. 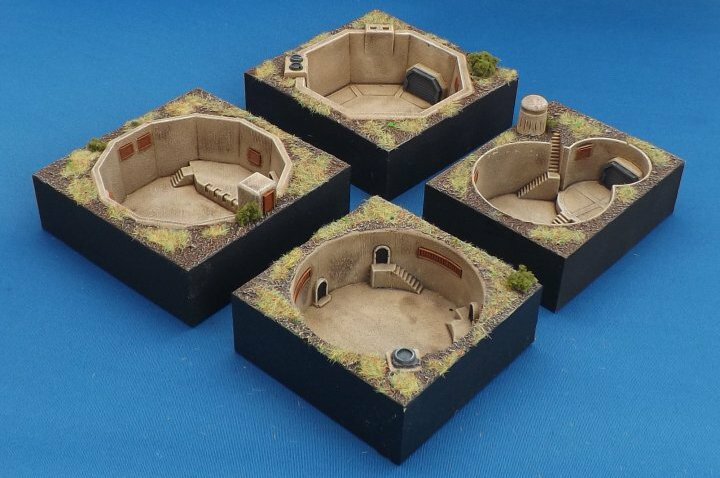 The first is a pack of four resin Jetties, two plain and two with buildings moulded on. The pieces are 5mm thick and have detailing all the way round so that they can be used as jetties or piers projecting from land or as stand-alone islands. 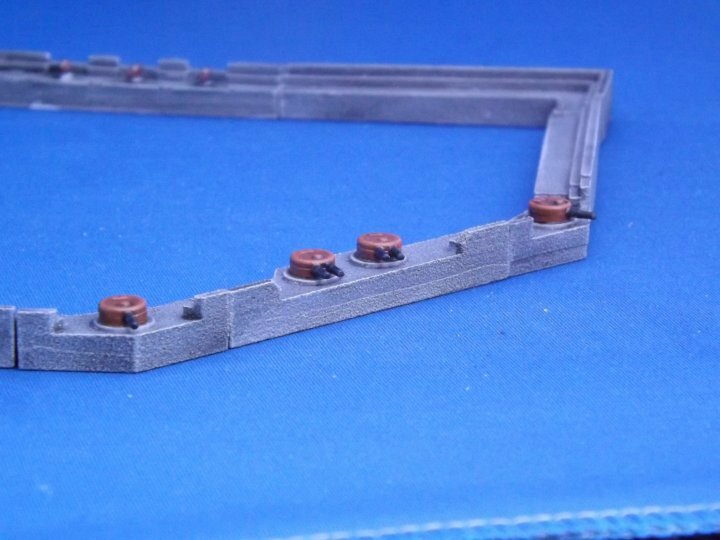 The second item is aimed at scratchbuilders and is a set of metal harbour front pieces that match the detailing and height around the edge of the jetties. The height of 5mm means that you can use standard thickness foam card to make the body of the dock and then edge it with the metal harbour front pieces. 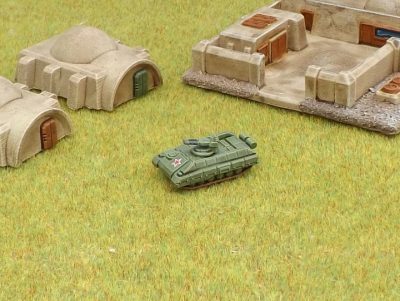 Brigade Models Neo-Soviet ground forces have recently been receiving all sorts of upgrades, with new types of tank and assault gun in both 6mm and 15mm scales. The one thing they needed to support these new vehicles was an armoured infantry carrier capable of keeping up with the tanks. Well, today that arrives in the form of the new BMP-BM. This vehicle is based on the chassis of the Bars tank, with a new superstructure capable of carrying six fully-equipped Guards riflemen. The rear-engined design precludes doors at the back of the vehicle, so access is via a two-piece hatch at the front next to the driver’s station. The release also includes a Guards Infantry Company with eight BMP-BM, a Lisa command vehicle and 48 infantry. There is also a new Guards Army Pack with 12 Bars tanks, 4 Terminators, 8 BMP-BM, command vehicles and infantry. 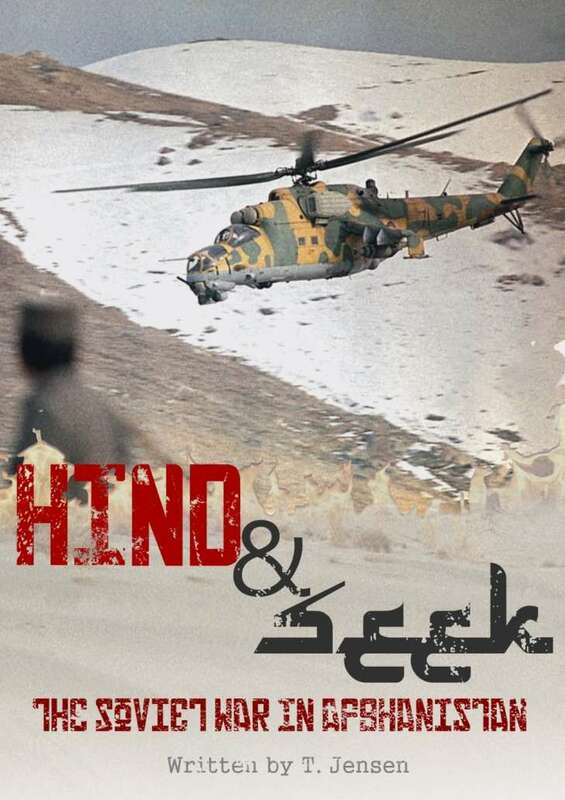 Hind & Seek is a ruleset from Ostfront all about asymmetrical warfare set in the Soviet-Afghan War and is aimed at company to battalion sized games, in 6mm or 3mm scale. Larger scales can be used just as easily, from 10mm and 15mm, up to 1/72 scale. The goal has been to provide a game where a small, poorly armed force can stand on even terms with a larger, better armed one. Hind & Seek tackles this in two ways: firstly, with a ‘strength’ system. Each faction has a strength value, which can be used to purchase forces on the table, or assets. Assets include recon, weapons caches, roadside mines, pre-prepared firing positions, escape routes, air-drops of anti-personnel mines, air blocking elements, night-time insertions and various other options, tailored to each faction. For example, only the Mujahideen (Afghan resistance fighters) have roadside mines and weapons caches, while only the Soviets have air blocking elements and aerial insertions or mine drops. In this manner, a small force could have a large number of assets allowing it to stand against a larger force. A small Mujahideen force might have prepared firing positions, weapons caches and escape routes, allowing it to strike and run against a larger Soviet force. Likewise an elite Soviet force might have all the bells and whistles of an extremely detailed and well-planned operation – extensive training, night-time insertions, blocking escape routes with helicopters and so on, to allow a small group of airborne elites to cut off and destroy a larger Mujahideen force. Assets also have a dual purpose where they can counter enemy assets. The Mujahideen keep ambushing from that village? Bulldoze it. The Soviets are using helicopters to block off your escape routes? hit them with anti-air fire to drive them off! 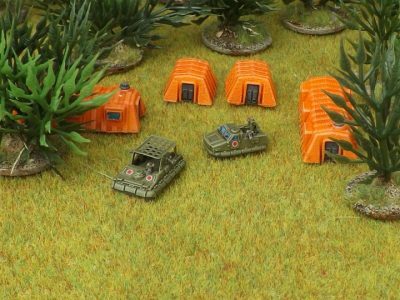 Brigade Models have released more reinforcements for their 6mm Hammer’s Slammers forces. There are uparmoured versions of the M2A4UA tank and M9A7 combat car, plus new artillery support on the form of the M53 20cm Artillery Hog. The new tanks have extra armour plating pretty over the entire hull and turret, while the combat cars also have additional hull armour, plus extra plating that fits over the existing mesh splinter shield. The M53 Hogs are enormous vehicles, as big as a blower tank and with a turret that wouldn’t look out of place on a naval destroyer ! The M53 can empty its six-round ready magazine in just 15 seconds and the ammunition options include nuclear, nerve agents and cluster rounds as well as the usual array of conventional munitions. The models are all available singly, or we have new army and detachment packs that replicate the existing organisations but with the uparmoured vehicles instead. There’s also a new artillery pack with hogs, mortar jeeps and command and observer vehicles. 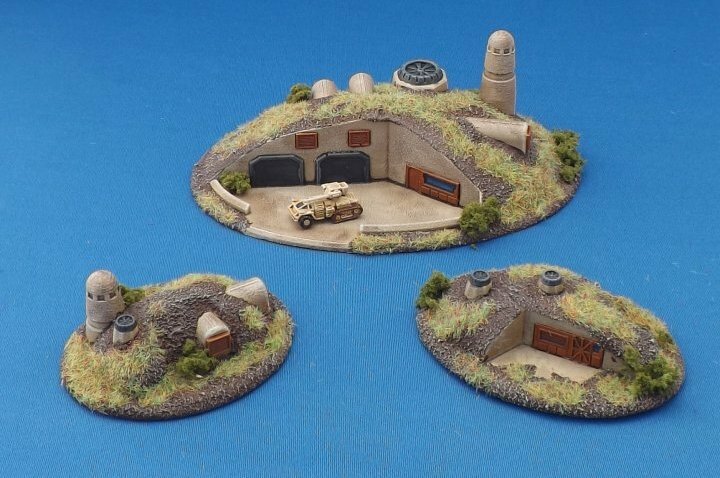 Brigade has a new release in their Small Scale Scenery range; a set of Harbour Defences pieces with fittings for various sizes and types of gun turret to expand their existing Harbour Wall set. They aren’t based on any historical prototype, so technically they’d fall under the remit of the Aeronef and Land Ironclads VSF umbrella. That said, the fixed gun positions are very similar to historical installations around the world, and Dover Harbour has a gun turret on the harbour wall which is still in position today. Four types of turret are available as standard – French, British, German or Russian, although other turrets from their accessories range would also fit.